With 10,000 maximum working pressure. 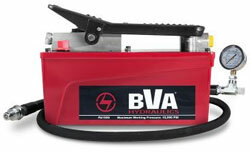 the BVA hydraulic pump is lightweight and corrosion resistant, made from high strength reinforced alloy reservoir which means longer service live and greater portability. A more cost effective solution that delivers the performance and quality you expect from BVA. Note: To reduce the risk of personal injury and/or property damage, ensure that the rated working pressure of each pressurized attachment be equal to or greater than the rated working pressure developed by the hydraulic pump. Note: Always check connections before using. Alteration of these products is strictly prohibited. Use only those adapters and attachments provided and approved by the manufacturer.